The other day at work, it was potluck day. I do like that I work in a place where co-workers like to share their passion for food (and other co-workers “volunteer” to taste the food!) It’s always fun to share recipes with people (I do write a food blog after all), and it’s also nice to talk about something else than work with co-workers. Cooking food, sharing food, talking about food are all great ways to get to know people a little better. So for our latest potluck, I decided to bring something typically French. I think people in general, have higher expectations when it comes to my cooking skills just because I’m French. It does add a little more pressure on me, because I do not want to disappoint them. Also, since I’m the only “French” person in the office, I want to “represent” my country properly. I wouldn’t go as far as saying that I don’t want to “let my country down”, it’s only cooking after all, but I admit that I have some “French Pride” when it comes to my cooking. I decided to bring some Gougères. 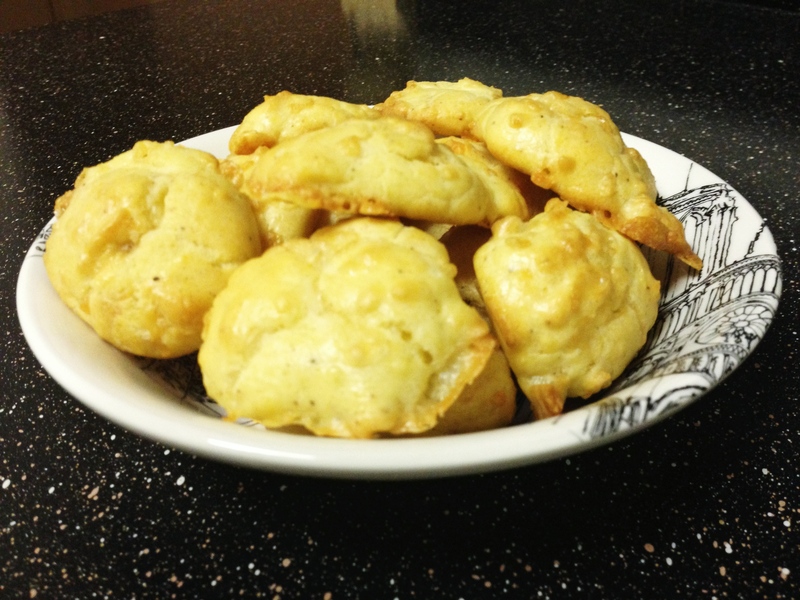 Gougères are pretty much “Cheese puffs” that are usually made for the apéritif. They are delicious, and since they are little bites, it is very easy to get carried away and eat way more that you initially intended (I warned you!) 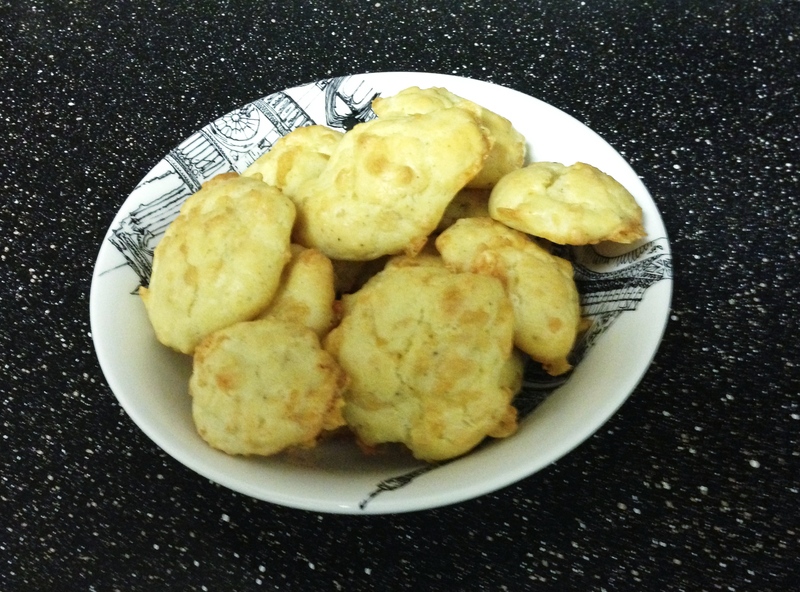 I think my Gougères were very good, but I still believe the ones my mom makes are even better! In a pan, boil half a cup of water, butter and a bit of salt. Remove pan from stove, add flour all at once. Stir vividly. Put pan back on stove (low heat), and stir for 1 min until the dough does not “stick” to pan. Put parchment paper on cooking sheet. Using two tablespoons, make small “dough balls” and put on cooking sheet. Be careful to leave enough space between each Gougères as they will rise during cooking time. Cook for 15 to 25 min or until golden (watch closely). *You can prepare dough the day before and store it in fridge overnight for best results. Movie to watch after dinner: The Intouchables (2011), beautiful and very funny. I read this and I absolutely will be making them. Heaven is right! Let me know how they turn out! Glad you liked them.